Acting Balanced: Do your preschoolers deserve a special shout out? Do your preschoolers deserve a special shout out? Did your child clean her room? Did he make his bed? Or maybe help you set the table? While you may have thanked them profusely, how thrilling would it be for them to get a special shout-out from their favorite TV character as well? Thanks to Sprout, the 24-hour preschool network -- through a partnership with StarGreetz -- now they can. It’s all part of Sprout’s Kindness Counts campaign, where kids’ are encouraged to perform small acts of kindness in an effort to establish positive values and social behaviors. 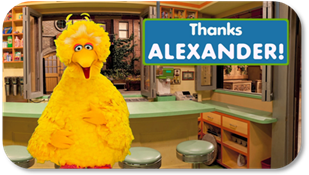 By simply clicking on http://www.sproutonline.com/kindnesscounts, parents are directed to a section of the Sprout website where they can record their child’s good deed and customize a message of thanks from Barney, Big Bird or Chicka the Chicken. I did one for Erik and he was enthralled! I love that it was really quick and easy and best of all.. FREE! What a great way to reinforce great behavior and share some special time with your preschooler!